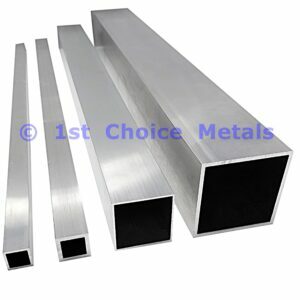 Here we are looking at Aluminium Square Tube, also known as Aluminium Box Section or Aluminium Square Hollow Section. Our Aluminium Box Section is extruded in a mixture of grades 6063T6 and 6082T6. Being extruded means that the tubes are truly seamless and are perfectly square, which makes them great for use as straight edges as used by brick layers, builders, plasterers, tilers and other tradesmen. An Aluminium Box Section has excellent corrosion resistance – it is perfect for outdoor applications as it will not rust. It is a lightweight product, just 1/3rd of the weight of steel box section, and it is excellent for welding. Therefore, an aluminium box section is often used to manufacture welded frames and bearers for applications such as commercial vehicle bodies, trailers, horse boxes and caravans. Should you require your Aluminium Box Section mitred and welded into a frame, please contact us for a quote. We are a UK supplier of Aluminium Box Section that cut to size – simply select the nearest length from the drop down menu and then follow the instructions on screen to get your Aluminium Box Section cut back to your required length, Free Of Charge. We also stock Plastic End Caps for some sizes of Aluminium Box Section – these are ideal to complete your project and give it that finished, professional look. When measuring Aluminium Box Section, it is important to remember that the quoted sizes are external. If the internal hole size is important for your application, please see the table below. (Outside Dims x Wall Thickness) Nominal Internal Dims.